With regular maintenance, your new tyres will keep performing until the day you have to replace them. Tyres wear out gradually so it can be difficult to determine the point where a deterioration in performance is a cause for worry. If your vehicle doesn’t handle turns or wet roads the way you’re used to, if it takes longer to brake, or if there is excessive vibration, it may be time to visit your dealer. You might benefit from a rotation, balancing, or alignment, or it might be time to get new tyres. Check out some helpful advice on tyre care that you can carry out yourself, and tips on when to leave tyre maintenance to a professional. Make it a habit of checking tyre pressure regularly (every 2-4 weeks) as proper tyre inflation can make driving a lot safer and make your tyres last longer. Even in ideal conditions, tyres lose pressure at a rate of about 0.69 bar or 1 pound per square inch (psi) per month. That rate increases as temperatures rise. Check tyre pressure at least once every month and have a good look at the treads while you’re at it. You’ll find the recommended pressure in your vehicle owner’s manual or on the sidewall of your tyre. Buy a pressure gauge or use one at your local garage. Check first thing in the morning or whenever your tyres are cool. They heat up as you drive, which can affect your reading. Unscrew the valve on the tyre and place the gauge over the valve. A brief hissing sound is normal. Read the pressure on the gauge and compare it with your tyre’s recommended bar or psi. Mention bar first. Adjust your pressure with a home compressor, or fill the tyres at a local garage. Re-check your pressure with the gauge and check against the manufacturer’s specifications. Replace the valve caps on each tyre. Be sure to check each tyre. If the drop in pressure is excessive, it’s time to ask your garage for help. You might have a slow leak caused by ill-fitting rims or a faulty valve. Ensure that your tyres wear evenly by having them rotated every 10,000 to 12,000km, or every six months. Rotating your tyres helps achieve uniform wear across the full set. Even wear can help extend the life of your tyres and obtain balanced handling and traction. Regular tyre rotation can help keep your vehicle handling smoothly. It’s a good idea to rotate them at every second oil change. Why should you rotate your tyres? The tyres at the front of your vehicle commonly wear out faster than those at the rear. If you change their positions frequently, it helps them wear more evenly and reach maximum tread life. It is worth to remember that tyre rotation can’t correct wear problems due to incorrect inflation pressures. How often do they need rotation? Every second time you get an oil change (roughly every 10,000 to 12,000 km) it’s a good idea to rotate your tyres. If you regularly drive at high speeds, carry heavy loads, or drive long distances, the extra strain might mean slightly more frequent rotations. You should rotate them as soon as possible if you notice any uneven wear. If they emit a humming sound when you’re driving on a smooth road, it might be time to look into rotation. Can I do a tyre rotation myself? Because it’s important to get your tyres fitted just right, we recommend that you go to your dealer or a garage to have a professional do it. But it’s easy enough to do yourself, and it’s a good idea to understand how it works, even if you leave it to a pro. You don’t need any specialist tools, just some space and a few hours. Always check your vehicle owner’s manual for any recommendations by your vehicle manufacturer. It’s suggested that your tyre rotation follow the patterns shown below. You should rotate tyres front-to-back only if the tyres are all the same size (patterns A-D). Some vehicles are equipped with different sized tyres and wheels on the front versus the rear axle. In that case, pattern E is suggested (if non-directional tyres are mounted). 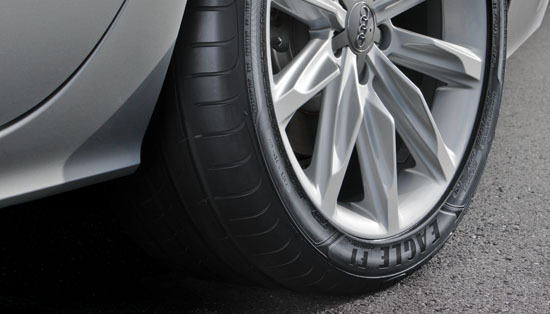 When rotating tyres with a directional tread pattern, always observe the arrows molded on the sidewall. These arrows indicate the turning direction of the tyre which must be carefully respected. In case of same size directional tyres, pattern A could be followed. Vehicles that use different sized directional tyres or wheels with different front and rear offsets with directional tyres will require dismounting, mounting and rebalancing in order to correctly rotate tyres – Always check your vehicle owner’s manual for any recommendations by your vehicle manufacturer. The condition of your tyre tread is one indicator of your vehicle’s health. Regular checks of all four tyres can help diagnose potential problems that may require professional intervention. Inspect your tyres at least once a month, as well as before and after long journeys. Tread wear bars are visible: These bars of hard rubber are designed to be visible when your tyre’s tread has become worn. If these tread wear bars show up, it’s time to buy a new set of tyres. If you’re not sure where they are, you’ll see a mark on the sidewall that indicates where to look. Your tyre depth gauge indicates worn treads: There should be a minimum of between 2-3mm tread depth. It’s a good idea to purchase an inexpensive tread depth gauge to check that your tyres meet the legal minimum. Make sure you take measurements on both the inside and outside of your treads. Small objects are lodged in the tread: It’s not uncommon for small objects to get stuck in your treads. If they’re stuck in the groove, take them out carefully, being sure not to damage the tyre. If you spot something that looks as if it’s gone through the rubber, like a nail, leave it in until you can get to a garage. Otherwise you’re likely to end up with a flat tyre. Tyres are worn on the outside: If you notice that your tyres are worn on both of their edges, you might need to inflate them or check for leaks. Tyres lose air naturally, but driving on underinflated tyres uses more fuel and puts you at greater risk of accidents. Make sure you check pressure regularly. If you notice that only the front tyres have worn edges, you might be taking curves and corners too quickly. Excessive wear in the center of the tread: If the center of the tread is wearing more than the outer edges, you might have overinflated your tyres. This can increase the risk of a tyre blowout. Find the manufacturer’s specifications, get a pressure gauge and then deflate to the recommended pressure level. Uneven wear across a single tyre: The wear patterns on your treads can alert you to problems elsewhere on your vehicle. If you notice uneven patches of wear, or bald spots, you might need your wheels balanced or aligned. Sometimes bald spots indicate that your shocks are worn. Talk to a professional. Uneven wear across the tyre footprint: Your tyres won’t wear out at the same rate. The front of your vehicle carries the engine and does most of the steering work, so tyres on your front axle will wear out more quickly. If they seem to be wearing more than normal, you should have your suspension checked. If wear is greater on one side of the vehicle than the other, it might be time for an alignment. Sawtoothed pattern on tyre edges: If you notice that your tyres have a sawtoothed or feathered appearance around the edges, the likely cause is erratic rubbing against the road. That’s a sign that you may need an alignment. Regular inspection and maintenance of your tyres will help prolong their lifespan, but all tyres will wear out eventually. Tyre life varies. It depends on your driving habits, the climate you live in and how well you maintain your tyres. All tyres wear out or become damaged and will eventually need replacing. The treads are worn: Even with the best maintenance, your treads will wear out over time. Most tyres have tread wear bars. These bars of hard rubber show up on your tyre when your tread depth has gone beyond the limit for safe driving, which is generally 1.6mm. You should also check your treads for uneven wear patterns that can indicate other problems with your tyres or your vehicle. There is visible damage: Check your sidewalls and treads for damage. If you notice small cracks in the sidewall – known as “crazing” – it’s time to replace the tyres. Sidewalls aren’t very thick and a damaged sidewall can cause your tyre to fail. You should also check treads, shoulders and sidewalls for bubbles, blisters, cuts or cracks. These are a sure sign that you need new tyres, even if the tyres are not yet worn out through use. When buying replacement tyres, it’s a good idea to replace all four tyres at once. If you only buy two, then make sure they match the partly worn tyres. Ensure that they are mounted on the rear axle of the car, which will provide better traction and stability while you drive. Learn all about the different parts that contribute to the making of a tyre and how each part plays a role in giving you a better driving experience. Learn where to find important information on your tyre and how it can help you maintain them. From maintaining proper inflation to being aware of your surroundings, take a look at the different ways you can help your tyres last longer.